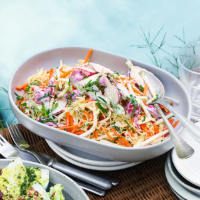 This crunchy coleslaw has a lighter dressing than traditional mayo-based versions. Using a sharp knife, finely shred the cabbage, removing the tough stem and core. Peel and cut the celeriac into matchsticks. Toss into a large bowl with the other vegetables, season and set aside. In a small bowl, whisk the crème fraîche, mustard, vinegar and caster sugar. Spoon the dressing over the vegetables and toss gently to coat. Check the seasoning again, then scatter with the chopped parsley to serve.